So I've had a little writer's block lately and haven't really had too much to write about. I'm not sure if it's because of lack of time or just laziness. I have been busy with Easter, travel to WVA and work but the main reason I haven't written is because nothing really jumped out at me to write about. As many of you may know, I love to work in the yard and garden. I have started mowing the lawn and I can already tell that the grass this year is going to be tough to keep up with. I got a little carried away with the grass seed last year. My yard has pretty thick, nice, green grass.... for the most part. There are still a few "problem" areas but they will have to continue to be a work in progress for a while yet. I love the spring with all the spring bulb flowers and all the blooming trees. Living near DC gives you a special dose of "Cherry blossom trees". The tulips around the White House at this time are also especially beautiful. Even though I have lived in this area for many years, I have only offically gone downtown to see the Washington Cherry Blossoms only once. The traffic makes it a miserable trip in most cases. 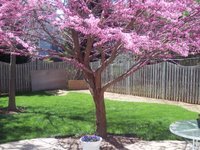 As I was enjoying all the wonders of nature in the springtime, it's hard to miss my beautiful redbud tree that is in our backyard. I say "my" redbud because it seems most of my family are not fans of the tree. When we first moved into our house 20 years ago, we had a cement patio poured out back and the above basketball hoop installed at the same time. The idea was to have an area for our outdoor table AND to give the boys someplace to practice basketball. Well, the outdoor table was always pushed off to the side, out of the way, and was rarely used for the purpose it was intended. The brand new patio soon had the required foul line painted on the concrete and it was rarely not in use. We always had a group of kids out back on "the basketball court", now never called the patio. All the kids who used to play here knew that the number one goal when playing basketball out back was to prevent the ball from hitting the back of the house and/or windows. ( On vinyl siding that basketball sounded like thunder when it hit!) 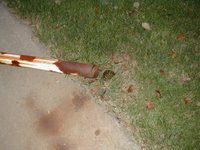 If too many occurrences of the ball hitting the back of the house happened...it meant that Dad would come out and end the game. As the tree started growing, it became a real problem for the three point shot. The branches made a few of the shots almost impossible. It was always an argument with the boys regarding pruning that tree. If I turned my back too long, there would be branches mysteriously gone. They always were fussing about how much they hate that tree and how it is in the way of their game! If I had a dollar for everytime they complained about my tree, I would be rich today. The basketball hoop finally bit the dust, due to rust. Thank God no one was hurt when it fell because a game was in progress when it finally gave way. I think the boys all miss the basketball hoop but now that the tree is so much bigger, it really would have made the basketball area very small. There definitely is no place to shoot a three point shot. I think they are a little stubborn to admit that my redbud tree is a beautiful tree now. They still can't help but complain about the "basketball days" and how the tree was so annoying. I should remind them that that beautiful tree provides a good bit of shade for the OBB and for keeping the kegs in the shade for the OBB! I will always call it my beautiful redbud tree and they will always refer to it as that @#*$ tree- but it is definitely all a matter of perspective! stupid tree.... i'm usually the one that has to clean up all those "pretty buds" once they die and fall off. also - I hit the side of the house with the basketball a few times and was given a stern warning by Tom the Younger. I didn't take heed. Then Tom the Elder came out and I stopped playing basketball altogether. that's almost like the "hit the furnace in kickball twice and that's the end of the game" rule. The first time there was usually a "warning shot" from upstairs which means, if someone hits it again, we're in trouble... but that's a risk we were willing to take....until we actually hit it again. Then of course we'd hide the ball, and run to go sit on the couch like nothing had happened... out of breath from running, and trying to pretend that we weren't actually playing kickball in the basement. and he almost fell for it everytime... Almost being the key word here. I always knew! Why do you think we had a wide open floor. Just did not want yous guys to run into the pole in the middle and break your arms or bust out your teeth. Busting out teeth is not fun,, Ask you oldest brother. 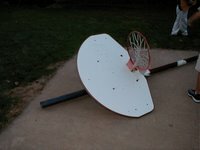 But we had no broken bones or teeth.. so it worked..
On the basketball thing.. The competition was heavy. The ball was thrown to hard to your teammates or foes thus thru the arms.. against the house. That told me that the competiton was getting to much and time to slow it down.. Game Over.. It worked as well... no broken bones or teeth.. METHODS TO MADNESS It is a parent way of subtle control without being controlling.. You all will learn this when it is your turn. 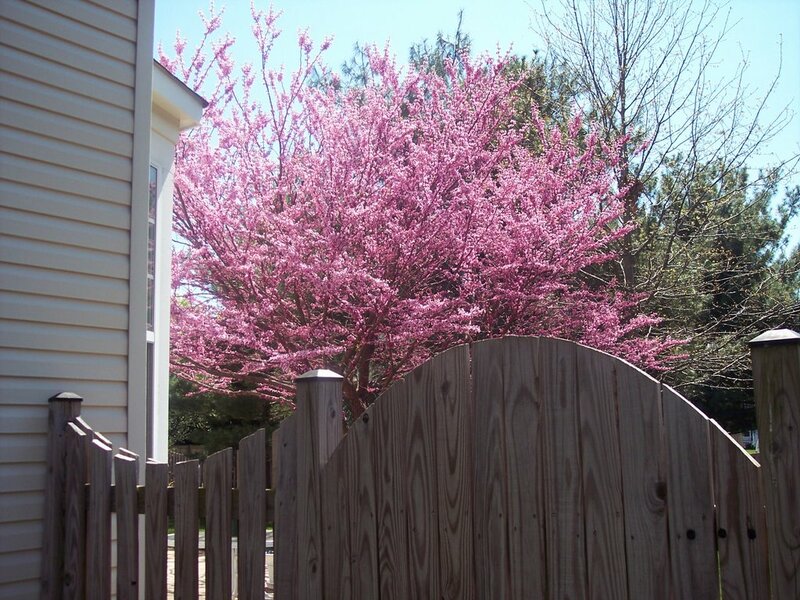 your redbud tree is beautiful and I am jealous! 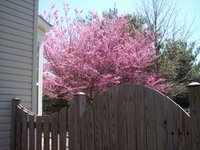 My red bud tree is not as good looking....but it is well placed!! actually almost in the same place as yours...but it is hard to mow around.